Spring is most definitely in the air, and at the Earth Day Market in Kichijoji in March I spotted my first nanohana - flowering greens that like takenoko are one of spring's distinctive flavors - along with sprouting rhubarb, tulips, and crocus in my garden so it must be on its way. And the Nippori Farmer's Market this past weekend was much the same despite chill winds, a smattering of rain, and cloudy weather. It seems to me that if you're hankering for a taste of Spring in any way a farmer's market might just be the place to find it! 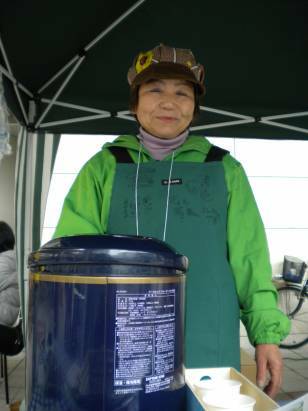 Photo Note: Tatsuko Onaya took a break from serving up her most amazingly scrumptious manju (savory as well as sweet - bless her heart) at the Nippori Farmer's Market this last Sunday for a quick photo.